Woody, Buzz Lightyear and their plaything pals are coping with abandonment issues in the new "Toy Story" sequel. In Next year's "Toy Story 3," the gang realizes they have reached their shelf life as the young boy who owns them grows up and goes off to college. "Toys are put on this Earth to be played with by a child," said John Lasseter, director of the first two "Toy Story" movies and chief creative officer for Pixar and Disney animation. "The thing they worry about the most is all the things in life that prevent them from being played with, and probably the thing they fear the most is being outgrown." Lasseter and his Pixar colleagues talked up the "Toy Story" sequel at the Cannes Film Festival, where their latest animation adventure, "Up," was the opening-night entry. "Up" director Pete Docter, who helped develop the stories for the "Toy Story" flicks and was an animator on the first, said the creative minds behind the original movies holed up in a cabin for two days to brainstorm ideas for the third. "For a while, we were worried that we didn't have the story. We were like, `Oh, nothing's coming,'" Docter said. "Then something clicked on the second day, and it just, like, flooded." 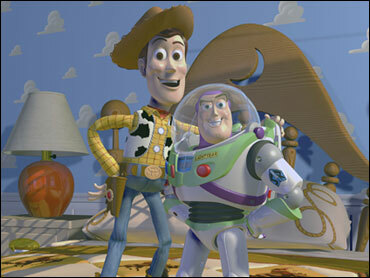 Tom Hanks and Tim Allen return as the main mouthpieces, providing the voices of toy buddies Woody and Buzz. Lee Unkrich, one of Lasseter's co-directors on "Toy Story 2," is directing the new sequel. "Toy Story" was the first computer-animated feature-length movie, launching Hollywood into an era of digital cartoons that have superseded hand-drawn animation. Pixar movies, including "Finding Nemo," "Ratatouille" and "WALL-E," have won four of the eight Academy Awards for feature animation since the category was added in 2001. Ed Catmull, president of Pixar and Disney's animation studios, said Pixar only does sequels if there is fresh ground to cover, and the "Toy Story" characters lent themselves to a whole new adventure. "It feels like the summation of a trilogy," said Catmull, adding that the filmmakers had hit on a big emotional finish to "Toy Story 3." "I'm going to wait on that one. That's got to be the surprise of the film."